Located in the heart of Harrisburg's Restaurant Row, Café Fresco features Asian American flavors alongside wine and drink specialties. From the moment of your arrival you will be enveloped in our elegant and relaxing space and paired with an experienced server to guide you through a beautiful meal. Give the gift of an ultimate dining experience with a gift card to Cafe Fresco. Available in all denominations and delivered directly to the recipient of your choice! 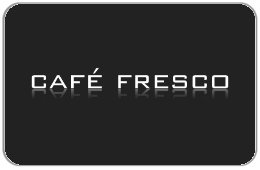 For balance inquiries call the phone number to a Cafe Fresco's location below.